Just doing a quick search on Retro to see if there was any reports about the rumored Starfox game, and I encountered the Glass Door profile for Retro and was shocked to see reviews as recent as May 2018 all claiming similar problems, even stating that they are half expecting Nintendo to close the doors. 1. Poor leadership and management / peter principle. Most of the reviews "Disapprove of CEO"
has there ever been good reviews on Glass Door? how many reviews are there for Retro even? compared to how many that work there? Ouch. Sad, but not entirely unexpected. Obviously some of that is "Good for the games industry" not just overall good. Retro sample size is small though. Retro having some serious internal issues is long rumored. Some large companies seem to fight against the (obvious) negative bias the platform is built to attract by asking people to make them (Blizzard, for eg, have quite a few really good reviews). I wouldn't ever take Glassdoor reviews, almost no matter how negative, without a pile of salt so large it makes the entire process almost pointless. Don’t companies usually have more bad reviews than good on Glassdoor? Umm yeah? The company I work for has very positive reviews. And I can point to a number of game studios also with very high averages, but that's not really the point. Glassdoor is more or less an outlet for disgruntled employees to vent. Yeah, looks like Glassdoor reviews. They have a point. Glass Door is VERY likely to have more negative than positive reviews, simply because of human tendency to want to complain when something is wrong, but stay silent when it's good. Reminder that there does not appear to be any sort of verification process for posting Glassdoor reviews. Some of these could certainly be real employees but some could easily be trolls. Glassdoor is almost entirely worthless for basically any resembling the actual internal workplace of a company. Combination of almost no verification making it really easy to fake, and human tendency to complain when things are bad but not post when things are good. I'd take the fact that they haven't shown anything in 5 years more seriously than some Glassdoor review to show that something is wrong there. "Half the team is expecting Nintendo to shut it down" - That doesn't sound good. A real shame. Nintendo should really change up the upper management. Whatever they're working on will be their first title without Tenabe at the helm. I'm cautiously optomistic but this long dev cycle isn't a good sign. Jeez. Incredibly awful. Just...awful. Hope this company can land back on its feet and those employees can find work and express their creativity. Whether the rumors and speculation are on point, using glassdoor to support it is a little too much over the rational concern line for me. This is stupid. It’s in human nature for us to be more vocal about negative experiences than positive. Two reviews from a company the size of Retor over a three month period really means nothing. Is there potentially something going on internally? Sure. But I’m sure as hell not using these two reviews as evidence of definitive proof. Is it really so hard to accept that a company that has been missing in action for five years without an announcement in sight - may just maybe going through some trouble. Not looking good, could why they had nothing to show. Its so secretive that tbh its difficult to judge what is happening at the company based on those reviews alone. Nintendo keeps the door shut tight. Two employees are probably not representative of the company anyway. They haven't released or announced a game for so long you'd guess they are having a tough time. Wonder if they will ever be able to release a great game again. At this point, I'd guess most developers of old have left. I was going to say. There is a phenomenon that people only leave negative reviews to complain and never positive reviews (unless the company asks them to). Glassdoor isn't the end all be all. More people are likely to post negative reviews than positive reviews. People tend to complain more vocally than they praise. 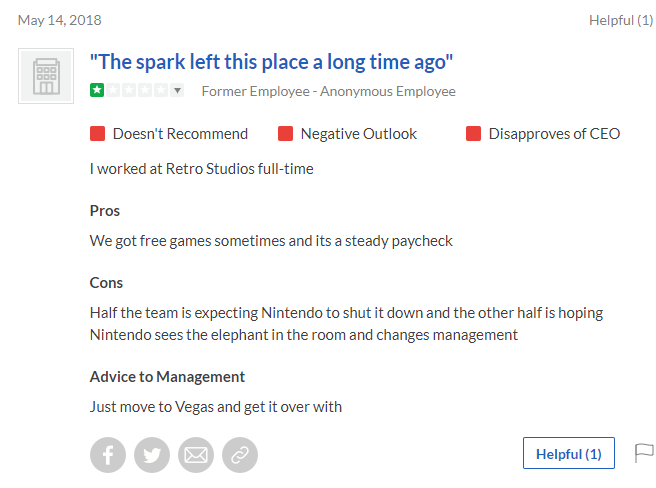 Not saying that Retro is perfect or that the employee posting is wrong, just that we need more information to go off of than Glassdoor. The May 14th review is probably a troll since it came out on the same day of the Kotaku article saying that Retro had a game that was basically cancelled. 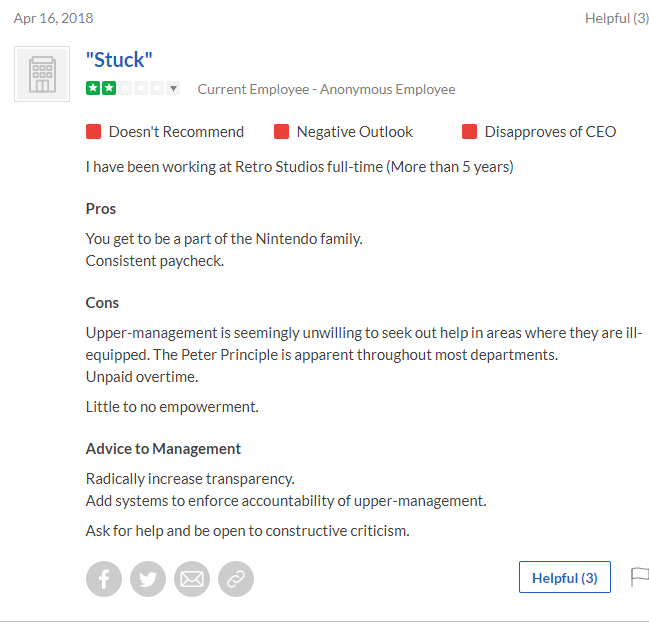 The April 16th review is probably legit, things obviously haven't gone well at Retro, but there's a lot better evidence that one Glassdoor review? -The head of the studio might have been demoted back down to Art Director. ...There are other things that are more accurate than Glassdoor. Glassdoor reviews are always either super-positive or super-negative, there's really no middle ground. I mean you are talking about a studio that hasn't even announced their game going on 5 years let alone released one. You dont need Glassdoor reviews to see something has gone very wrong over there. Not sure why there are some still in denial about it. Given that one of those reviews was posted the exact same day that Kotaku said their non-Star Fox project was going through some rocky development, I'm not so sure that it's legit. Considering the games ex-Retro people made range from mediocre to trash, it's obvious that the only ones responsible for the success of Metroid Prime and DKCR/TF are people above Retro from Nintendo proper. I mean you are talking about a studio that hasn't even announced their game after 5 years let alone release one. So far all I've seen is people questioning the validity of Glassdoor which is perfectly natural for a site like that. RateMyTeacher is the same way. I mean you are talking about a studio that hasn't even announced their game after 5 years let alone released one. When the lead game designer of the company leaves the company after his game is seemingly cancelled, it's probably not going well, yes. The May 14th review is probably fake while the April 16th review is probably true. No, I think the issue here is using glassdoor to come to that conclusion rather than all of the other evidence like the absence you mentioned or the Kotaku article. I've asked multiple times and looked at the website but I don't think there is any actual verification process for posting reviews on glassdoor. This means we really can't trust that any of the reviews are legit employees, they could easily be trolls. The May 14th one specifically looks like it is a troll. But yeah, there's no denying there's been trouble at Retro. The only question is- was this trouble just something that happened years ago resulting in their rumored canned/shelved project, or is it still happening now? Seriously. Basing a judgment off of two anonymous reports when there's a bias towards complaints instead of praise. I'm not saying all is well at Retro, but need way more corroborated reports than this. Glass Door reminds me of Apartments.com. Everyone hates where they work and live it seems. Or only the negative gets posted online. Yeah there's surely a strong selection bias at work here. Reviews should thus be taken with a grain of salt. Retro being taken off Metroid after making the amazing Prime series is probably proof enough that something is wrong. This sounds like unreliable evidence pointing to something we already know. This Thread won't go well. No one ever believes these reviews. Dunno if Glassdoor has some kind of credibility, but it's weird to see that Retro became stagnant while Monolithsoft grown up. After all Retro is/was the best western branch that Nintendo had these days. News has been circling about this since 2012 since I first heard of it. Hilarious reading this thread, "lalalala everything is fine"
The point of the thread wasn't to say it was the only evidence, I thought that was incredibly obvious given the aforementioned report about the game cancellation, absence from public and shuffling of positions. This was just to mount onto the existing reports that things don't look swell in Austin at the moment. Hope they can turn it around.